Saturday July 13th 1878 Weather still very warm. We did a little house-work in the morning while Mother went to town. In teh afternoon we picked a few more currants to put up. Got our supper over early and sewed some after supper. Went to bed early. Sunday July 14th 1878 It was very war today. But Rob and I went to church. I was fairly over-come with the heat when I got home. In the afternoon we had a hard rain lasting an hour. It was much cooler after that. I wrote a long letter to [Zene?] in th afternoon. And in the eve one to Mollie Briggs. Mr Whetstone was here in the evening. 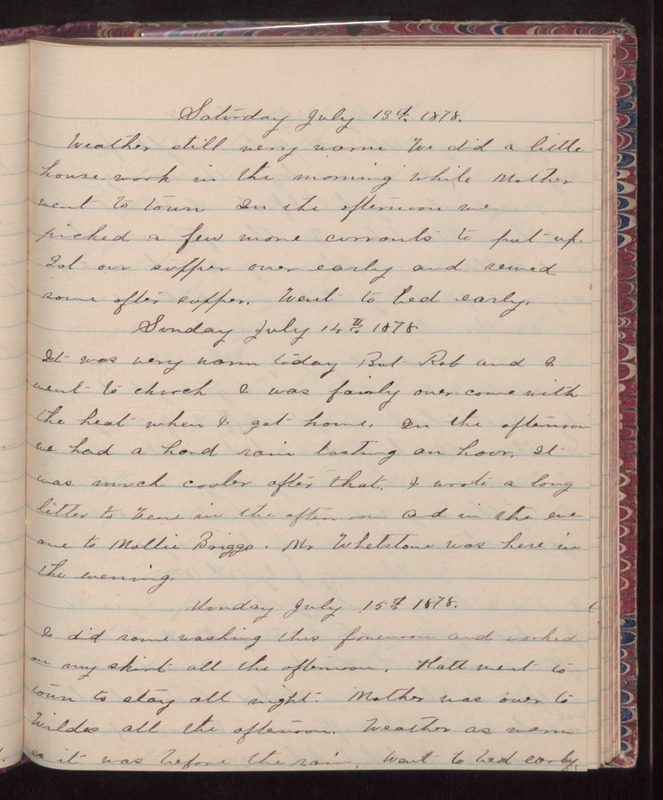 Monday July 15th 1878 I did some washing this forenoon and worked on my skirt all the afternoon. Hatt went to town to stay all night. Mother was over to Wildes all the afternoon. Weather as warm as it was before the rain. Went to bed early.